Russia's lower house of parliament has backed a long-delayed reform to the European Court of Human Rights. Before Friday's vote Russia was the only one of the Council of Europe's 47 member states that had not ratified Protocol 14. The court based in Strasbourg, eastern France, has a huge backlog of cases. Protocol 14 is part of the European Convention for the Protection of Human Rights. It was ratified by 392 Duma deputies, with 56 against. Ratification in the upper house, the Federation Council, is expected to be a formality. Russia faces the largest number of cases pending before the court - 28% of the total. The Duma had refused to ratify Protocol 14 in 2006, with deputies alleging that it was incompatible with Russian law. This prompted officials in Strasbourg to warn that the court was on the verge of collapse. But after a Council of Europe meeting on 14 December, Duma Speaker Boris Gryzlov said the Council had agreed that a Russian judge would participate in any decisions concerning Russia. Friday's vote is a major change in policy and appears to be the result of a call from President Dmitry Medvedev, the BBC's Richard Galpin in Moscow says. Protocol 14 would cut down the number of judges on panels charged with deciding issues such as the admissibility of cases. It also paves the way for new rules to ensure that states implement fundamental changes to national laws or practices, as ordered by the court, European affairs analyst William Horsley says. Experts say the changes would speed up the handling of cases by up to 25%. 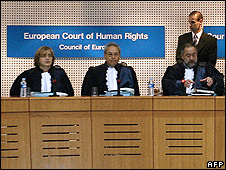 The European Court of Human Rights currently has more than 100,000 cases on its books. Russia's reluctance to sign up to the reform until now is because more than a quarter of all the complaints sent to the court concern alleged violations of human rights by the Russian state, particularly in the predominantly Muslim region of the North Caucasus, our correspondent says. He says that in the past the court has upheld many complaints against Moscow ordering that compensation be paid to families whose loved ones were either killed or abducted by the security forces in areas such as Chechnya. The families often see the court in Strasbourg as the only place where they can seek justice, he adds.